Austrian Federal Chancellor Sebastian Kurz has declared support for the introduction of a peacekeeping mission in Donbas. "The Austrian federal government will support this idea. 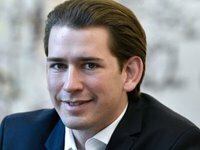 I understand that until that happens, there will be more talks, many steps need to be made," Kurz told a joint press conference with Ukraine's President Petro Poroshenko in Vienna on Thursday, when asked about a possibility of Austria siding with the introduction of peacekeepers in eastern Ukraine. Once this mission has been created, a decision will be made which countries will participate in it, Kurz said. "Should there be a request or wish from Ukraine for Austria also to join or provide some assistance, we the federal government, our defense minister, will discuss it," Kurz said. Kurz said that for this mission to be introduced he is prepared "already today to express our full support for the implementation of this project." For his part, Poroshenko thanked Austria for supporting the idea of a UN peacekeeping mission in Donbas, expressing confidence that this mission could act as a firm guarantor of ceasefire, disarmament of illegal armed formations, stimulate the withdrawal of Russian forces from the occupied territory and ensure a reliable closure of the border with Russia "so that we finally, after implementation of the security package, could proceed to the stage of political settlement."